Indiscriminate use of chemical fertilizers in Agriculture is a cause for concern and has drawn the attention of the government because of its implications on environment, socio-economic and production fronts. 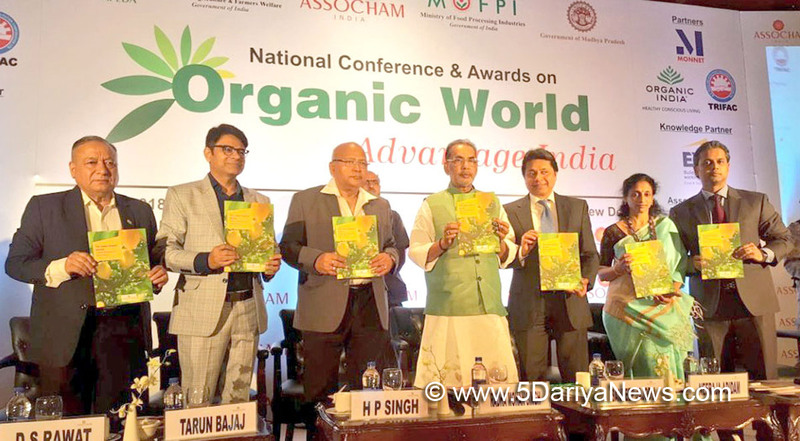 This was stated by the Minister of Agriculture and Farmers’ Welfare Shri Radha Mohan Singh while addressing ASSOCHAM’s National Conference on Organic farming in New Delhi, today.He said India is traditionally the world's largest organic farming country. Organic farming is already being doneon the basis of traditional knowledgein several parts of India. The government is committed to take India on the path of modernity in agriculture and wants to introduce new techniques. For a sustainable increase in production, the government has been promoting organic farming on priority.He said it is the mission of Hon’ble Prime Minister to ensure a successful “Organic Farming Revolution” in India on the lines of “Green Revolution” so that the farming community benefits from it. Through government’s various schemes, approximately 23 lakh hectares of land has been made suitable for organic farming. In order to promote organic farming, the government has started the ParamparagatKrishiVikasYojana (PKVY), under which 2 lakh hectareshas been made suitable for organic farming thereby benefitting 5 lakh farmers. The Minister said the main objective of National Centre of Organic Farming is to promote organic farming in the country. Other government institutions like APEDA and Ministry of Commerce, while playing a leading role in improvement and control of certification system, are promoting the export of organic products. The government has initiated the Organic Value Chain Development for North Eastern region. The aim of the Ministry is to promote organic farming in hilly and tribal areas as the use of chemical fertilizers and pesticides in these areas is very low.The Minister said the government’s target is to cover 50,000 hectares under organic farming in the North Eastern states, out of which 45,918 hectares have been made suitable for organic farming and 2429 Farmers Interest Groups have been formed, thereby connecting 48949 farmers with the scheme. He said that in line with Hon’ble Prime Minister’s dream, India should move towards becoming a chemical free organic country.BSNL Launches Free Wi-Fi Facility at Udwada Village in Gujrat, Hon’ble Minister for (I&B) and Textiles Smt. Smriti Zubin Irani and MoC Sh Manoj Sinha jointly launch the facility State owned telecom player Bharat Sanchar Nigam Limited today launched Free Wi-Fi Facility at Udwada Village, Valsad District, Gujrat under Saansad Adarsh Gram Yojana adopted by Smt. Smriti Zubin Irani, Hon’ble Minister for (I&B) and Textiles. The facility was launched by Sh. Manoj Sinha, Hon’ble Minister of State for Communications and Minister of State for Railways in the presence of Smt Irani on the occasion of Navroz. Speaking on the occasion, Smt.Irani said, “Under Saansad Adarsh Gram Yojana Rs.16.48 Lakh is allotted for carrying out Wi-Fi by BSNL in Udwada Village. With the launch of Wi-Fi service today in Udwada Village, population of 6000 citizens in village as well as surrounding area will be benefited. Citizens of Udwada and surrounding area will be able to use Unlimited Internet Data and Udwada Village has become Digital Village. Udwada village has been adopted by me under Saansad Adarsh Gram Yojana. This is vision of Hon’ble Prime Minister for strengthening the villages and make effort for extending benefit of digital India to the last miles.”Shri Manoj Sinha appreciated the efforts of BSNL for extending Wi-Fi facility to Udwada village. He said on this occasion, “BSNL is also deploying 35,000 Wi-Fi Hotspots on PAN India basis to improve the Broadband penetration with 2G/3G mobile data Wi-Fi offload solution. Under this project till date more than 7700 Wi-Fi hotspots have been installed.”Shri Anupam Shrivastava CMD BSNL said that two Hotspots with 17 Access point have been installed at Udwada village. He said that he has come to know that Udwada is a town in Gujarat, renowned for its Zoroastrian Atash Behram. This place of worship is the oldest still-functioning example of its kind, and has established Udvada as a pilgrimage center for Zoroastrians the world over. BSNL is undertaking the project for providing 25,000 Public Wi-Fi Hotspots at Telephone Exchanges of BSNL in rural areas using BSNL fiber as per the MoU signed between BSNL and USOF. Till date BSNL has provided Wi-Fi at more than 2500 rural telephone exchanges.BSNL has provided more than 7700 Wi-Fi Hotspots on revenue share basis through various partners namely QuadGen, Trimax & GOIP.